The Ride is Canada’s get-me-there app, a free*, all-in-one transportation that helps you find nearby taxis, compare cab and transit options and see car sharing locations in any city across Canada. It Works Everywhere: See all taxis and transit options everywhere in Canada. Compare travel times, costs and choose how you want to go. • E-Hailing: Order a nearby cab, get up-to-the minute ETA and get picked up in minutes. Make specific vehicle requests and pre-book a ride for a later time. 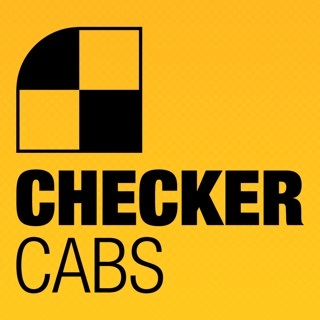 Be in contact with your driver directly through the app and get notified when your taxi has arrived. Then rate your driver when you’re done to make your next ride even better! • Connect to First Available Dispatch: Get a ride anywhere e-hailing is not yet available with our direct connection to over 500 fleets and 25,000 licensed drivers. You’ll never be stuck for a cab again! • Transit: Tap the transit icon and you’ll see the closest stops of every type every type of transit in your city, be it buses, subways, commuter trains and streetcars and then use The Ride’s information on routes, schedules and the real-time location of the closest vehicles to easily plan your route. • Taxi vs. Transit - See Your Choices in One Tap ! Easily compare travel times and costs get to your destination across all local transit options AND taxis. The Ride is the first to offer a side-by-side comparison tool for all modes of transportation in your area. • *Fees: The Ride is free to download, and during the first 30 days of use, there are no fees in using the service. 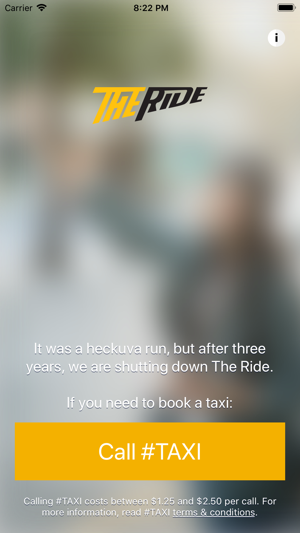 After the first 30 days, The Ride charges a convenience fee of $2 for e-hailing one of the closest cabs, and $1 when connecting to the first available taxi dispatch. In partnership with every Canadian wireless carrier, these fees are conveniently added to your mobile bill. There is no charge for using the app’s Transit service. It was a heckuva run, but after three years, we are shutting down The Ride. If you need to book a taxi call #TAXI. Can’t create an account. Always says” oops there’s an error “. On the bright side it works better than all the other terrible taxi apps in Vancouver. However it errors out and breaks and is confusingly designed. © 2015 CellWand Communications Inc.